Rita-Eileen Glynn Smith, a former Rockland County, N.Y., resident, notes on Facebook that she owns her great aunt’s Singer sewing machine, complete with accessories and the equally famous oil can. She has history in her possession, the nation’s, that of the earlier emerging middle class, too. Rita may recall that in her favored haunt of Nyack there was a factory — Willcox & Gibbs — which also manufactured various types of sewing machines. The site has long been closed, and the building was torn down just a week or so ago for luxury middle-class rental housing, which is more than symbolic because from that industrial site many a village family built the foundation for either their or their offspring’s life in the then growing American middle class. The same can be said of those thousands of souls who ran Singer, Willcox & Gibbs and other brands of sewing machines in the New York City garment industry. Many a Rockland family traces its journey to suburbia from the Lower East Side. Isaac Singer’s home model enabled cottage industry as families did job work in the house, their savings accumulating, then used the money for their children’s upward mobility as well as subsistence survival in the Great Depression. Eventually, many homes had sewing machines, and creative moms fashioned family clothing from patterns bought or cut from sizing on dress dummies. Today, the old Singer and other machines are collector items though the modern replacements and even some of the older ones are in great enough use. Gone, though, is the dream that building machines and then having others operate them would not only open the factory door to work, but the door in the home to an outside “staircase” where someone in the family would climb his or her way to teacher, doctor, lawyer, store owner, business person. And that the father, too, could pass his factory job to a son, who would then build his own stair of dreams. Like I said, Singers are collector items. My son, Arthur Henry Gunther IV, inhabits this space each holiday season. Here is his 2016 story. ​ It had been a strange year. One of those years where cynics seemed to stand up a little straighter, like some kind of posture I told you so. One of those years that provoked visceral reactions of all kinds. It was sickening to watch people suddenly emboldened with the idea that they had permission to give in to all manner of baser instincts. It was so easy to hate, to stop trying to evolve. It was all a bit sad. ​ Which was the state of mind that Ezra found himself in as he drove north on the day before Christmas. There wasn’t much light left and Ezra was happy just to be alone for a few minutes, to be just driving. He was one of those drivers that rarely drove in silence. Ezra always had the radio playing, whether it was music or the news. Since the election, though, Ezra had steered clear of the radio. The news was just that and the music too much a minefield of uneven songs and traffic and weather. Even the stations playing Christmas music offered little comfort. Luckily, his car still had a tape deck. The last month and a half he had taken to rifling through a box of unlabeled tapes he had made in the late 1990s and listening to nothing else as he drove. It had been so long since he had heard the tapes that the songs that played were always a surprise. Plus there was no news, no traffic and weather together, nothing to avoid. Maybe it was age, or Ezra’s innate tendency toward wistfulness, but the songs on the tapes seemed filled with some kind of sincerity that lately seemed in rare supply. It was strangely comforting. ​ As Ezra hit the Bear Mountain traffic circle and prepared to enter the lane to cross the bridge, something in him hesitated. He found himself instead veering right and heading toward the parking lot in front of the inn. It was always hard to just drive by Bear Mountain without stopping and he had left too early anyway. There was probably just enough daylight left for a walk by the lake. Turning into the parking lot, Ezra shut off the car, grabbed his coat and scarf, and began walking. ​ Walking with a notion of purpose, Ezra passed the inn on the right and followed the path down to the lake. Glancing to his left, he was surprised to see a thin layer of ice at the top of the water. There was no one around as far as he could see. The ice rink was already closed for the night and most people were probably on their way to wherever they had to be on Christmas Eve. The silence and stillness were a refreshing combination. Heartened and warming up with the effort of his walk, Ezra turned toward the path that led to the zoo and descended down the steps under the tunnel to the other side. Ezra was happy to see that the gate to the zoo was still open. Hopefully the bears were awake. ​Thinking himself alone, Ezra put his head down and quickened his pace, only to be startled by a young voice speaking out in front of him. Looking up, Ezra saw a group of ten or so girls gathered around the Walt Whitman statue that greeted each visitor to the zoo. There seemed to be two adult women accompanying them. The voice that had woken Ezra out of his stupor belonged to a girl, maybe nine years old, who stood atop the rock which Walt Whitman stood on. ​ Ezra recognized the words as belonging to Whitman. One of the adults saw him listening and came to his side. ​ She walked away and the speeches went on. ​ Ezra wasn’t sure if it was his current state of mind, or the sight and sound of these powerful young voices atop Whitman’s rock, side by side with the great statue, but the stupor that had held him the last two months seemed to lift with each reading. ​ The last girl climbed up. She was the smallest of them all. Though her face barely emerged from her coat and hat, her voice boomed out with authority, “The strongest and sweetest song remains to be sung!” The girl followed these words with a giant smile and bow. She was ushered down from the rock with a series of raucous rounds of clapping. ​Ezra stood frozen for a second, then lifted his head up and began walking back in the direction he came. He’d see the bears another time. ​With the echo of the young girls’ voices speaking Walt Whitman’s words filling his head, Ezra climbed back in his car and turned the ignition. The tape that he had been listening to before immediately came on. It was a song he hadn’t heard in years. Another song from the 90s that he had forgotten. The smile that had started to grow on Ezra’s face grew larger and more determined as the female voice on the radio sang, “Up up up up up up up, points the spire of the steeple. God’s work isn’t done by God. It’s done by people.” With that, Ezra drove on. It was not surprising that my childhood friend, Rose Marie Strippoli, appeared calm in announcing via Facebook that her beloved cat, Maggie, had passed after 18.5 years. I recall an earlier serenity under stress. Living then — spring 1952 — in south Spring Valley, N.Y., I had just learned to ride a bike, and I took my maroon job down the Old Nyack Turnpike to Harold Rickle’s house on Central Avenue. Up the hill lived Rose Marie and her mom, a nurse. Harold, Rose Marie, another young person and I soon found ourselves playing hide and seek, which was always an adventure at Harold’s house since it was two-family, and he either lived upstairs or downstairs depending on the tenant’s preference. This visit, he was below. I hid behind his family’s large refrigerator, the original electric type that had its round condenser on top so that the square machine looked like a robot. Running outside, I saw someone spot me, so I moved toward the back door. Just as I went to open it, the other young person, a girl who was the cousin of either Rose Marie or Harold, pushed aside the door in a hurry to escape someone else. My right hand went clear through single-pane glass, and I began spurting blood at the wrist. These were the days before 911 and EMTs, and since there were no adults about — all were at work — it was up to third-graders to figure out what to do next. In stepped fine Rose Marie, calm as can be. She took me by the hand and walked me up to her house, found her nurse mom and had her look at the wound. Rose Marie’s mother cleaned the wrist, realized it needed stitches, and knowing that my grandfather worked down the street as a foreman at the Briarcraft smoking pipe factory, called over, and my gramps took control. We went downtown to a doctor, who injected painkiller and stitched the wound. I have never forgotten how masterfully calm Rose Marie was, and how that helped defuse my situation. The memory was recalled after reading her Facebook post about Maggie. It could not have been easy for her to lose her cat after so many years, but Rose Marie handles crisis well, thank you. It was a crisp fall morning, and the third-grader had 15 cents in his corduroy pants pocket, a rarity since it was usually empty except for the tissue his mom stuffed there. The kid was always sniffling. Feeling rich on the nearly two-mile walk from his home off the Old Nyack Turnpike though he knew that White’s grocery store in Spring Valley, N.Y., would soon claim the coins, the boy thought a bit on what it must be like to be grown and carry money, as he assumed his parents did. Of course, that brought him to all manner of big boy, even man thought. Would he drive a car like his dad? Would he work in a small factory like his mom? Would he drive in the high school victory parade down Main Street after a football game? The hike from his home nearly finished and with both the South Main Street School and White’s next door in view, the young fellow stopped twisting the dime over the nickel and vice-versa and hurried into the grocery store so he could buy a tin of cloves before he was late for class. Ed White was a kindly man who once lived in the house the boy’s grandfather now owned and who later had a store in nearby Hillcrest. 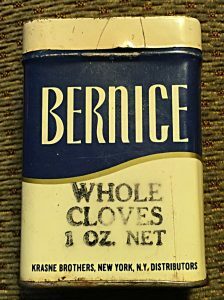 The fellow asked for cloves, and Mr. White used his long pole with a special fitting to tip the white Bernice brand off a high shelf and into his hands. The boy swapped the cash for the tin and hurried to his first-floor classroom where Miss Amy Rouy would later bring out 30 or so bright, large lemons and colored ribbon. She gave each of us a lemon and showed how to stick the cloves into a lemon and then thread a ribbon through the top. We were then to bring the spiced lemons home to our families and hang them somewhere in the bath. I think my mom had it there for a month, bringing a sweet fragrance to the room. The boy had come to school with his parents’ cash, which he figured was in his future, too, and went home with a present for his family, nicely arranged by a thoughtful teacher. Today, so many decades later, the boy now usually a man, keeps the half-full Bernice tin in his own family’s spice cabinet, reopening the can once in a great while to recapture a memory with as strong a flavor as the original.